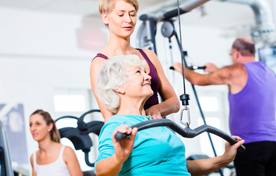 Our Newtown Square gym offers services and amenities for every age and fitness level. Older adults will enjoy the many senior fitness programs offered in our gym, such as our Silver Sneakers classes, that are designed to help you maintain your strength, flexibility, and balance while being low-impact so they are easy on your joints. We also offer fun weekly activities for you and your friends to enjoy together, such as ping pong and pickleball! These are perfect for helping you stay active in a social environment. We know that joining a fitness center can be daunting and can feel like a big commitment. Ellis Athletic Center focuses on making fitness fun and offers everything you need to stay active and motivated. We can help you develop a new physical fitness program, find a new activity to enjoy with your friends, and keep you motivated and energized every step of the way. We’re the perfect gym to join if you are new to the fitness journey or if it’s been awhile since you’ve been to the gym because we offer personal training services that can help tailor a fitness routine to your unique needs, abilities, and goals. Become a Member of Our Newtown Square Gym Today! Whether you want to start with an easy ride on a stationary bike or join one of our many exercise classes tailored to the needs of seniors, we’re ready to welcome you! If you aren’t already a member, you can come in and sign up for a free 3-day trial membership. We’ll help you get started and sign you up for a membership when you are ready to join! Get in touch with our team today if you have any questions about our facility, classes, or membership. We’re looking forward to seeing you in our gym soon!